A glittering adventure set in India at the height of the British Raj. The New York Times compared this book to Kipling's Kim and called it "a gorgeous entertainment." Of this early work, published when he was in his early twenties, Patrick O'Brian writes in a foreword: "In the writing of the book I learnt the rudiments of my calling: but more than that, it opened a well of joy that has not yet run dry." The story is about a young mahout—or elephant handler—his childhood and life in India, and his relationship and adventures with elephants. As a boy, Hussein falls in love with a beautiful and elusive girl, Sashiya, and arranges for another of her suitors to be murdered with a fakir's curse. The dead man's relatives vow vengeance. 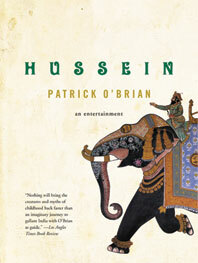 Hussein escapes and his adventures begin: snake-charming, sword-fighting, spying, stealing a fortune, and returning triumphantly to claim his bride. All of this is set against an evocatively exotic India, full of bazaars, temples, and beautiful women—despite the fact that O'Brian had never been to the East when he wrote the story.